Do you have a bright sunny location in your office? A bold colourful Croton plant would look great. Crotons are by far the most colourful indoor tropical plant you can find for your office or home. They can be a bit tricky to care for, so consider having a professional interior landscape contractor provide the maintenance. Crotons do best in a warm, humid environment, the opposite of that usually found in an office. If the air is too dry, they tend to drop their leaves. A sub-irrigation system is often the key to keeping Crotons healthy. Their vibrant colour is dependent on light; in lower light, the colour will fade and the leaves will appear mostly green. Crotons need a well-drained, light soil and consistent watering. Keep the soil slightly moist at all times. They are prone to spider mites. Regular cleaning of the leaves with a damp sponge or cloth will help control mites. There are hundreds of varieties of Croton. The plants are characterized by their leaf shape which may be broad, very narrow, grass-like, or twisted. The colours can range from deep burgundy, red, yellow, vibrant orange, rusts, and gold. When grown in bright light, you may see a unique, fragrant flower periodically. In Southern Ontario, Crotons can make a beautiful addition to outdoor planters in the summer months. Don’t have enough light for a Croton? Consider an artificial one. 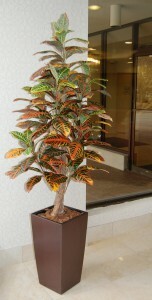 A Croton is one of the best replica plants available. Because the leaves of the real plant are thick and plastic-like, it is easy to make a high quality replica. Have a look at the image on the right. The Croton is one of our most popular artificial plants. We use it frequently in offices throughout the GTA.